We would like to thank Chickapig LLC for the preview copy of Chickapig used for this preview. Other than receiving the preview copy we at Geeky Hobbies received no other compensation. Receiving the preview copy had no impact on the content of this preview. Since this is a preview and uses pre-release components, the components and/or the rules might change before the final release. Shuffle the poop cards and daisy cards separately. Each player rolls the die and the highest roll gets to go first. Play proceeds clockwise for the rest of the game. 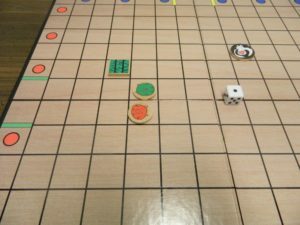 To begin a player’s turn they roll the die to see how many actions they will perform on their turn. A player must use all of their actions for a given turn and can use them to move one of their Chickapigs, one of their hay bales, or the cow. 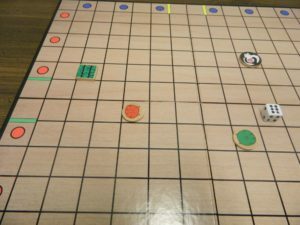 If a player takes too long to choose their actions, the other players can decide to flip over the timer and the current player has to finish their turn before the timer runs out. The goal of Chickapig is for a player to get all six of their Chickapigs to the other side of the gameboard and into the goal of their color. 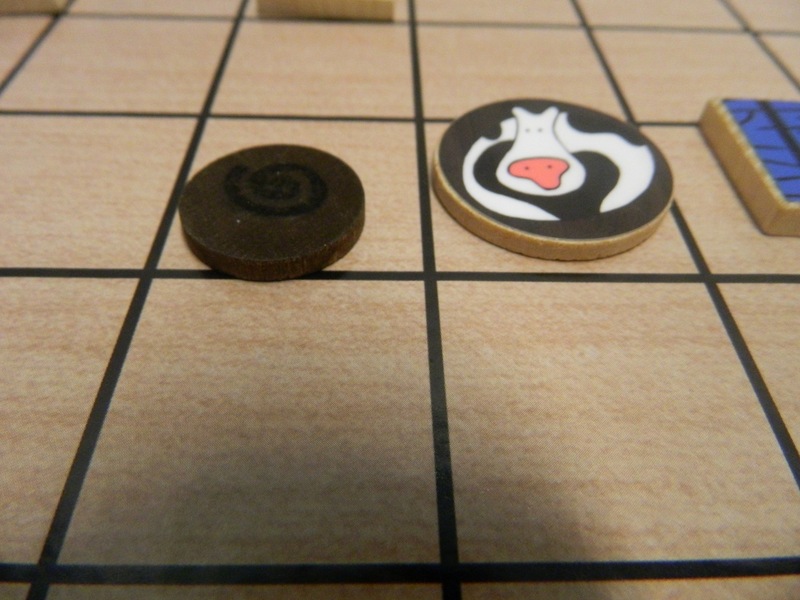 When a Chickapig enters their goal they are removed from the gameboard. Chickapigs move in a straight line in any direction except diagonally. 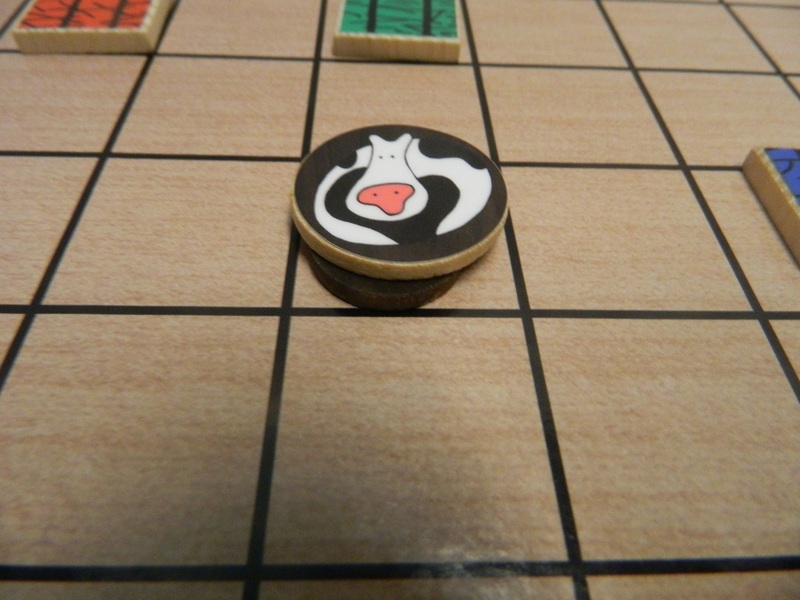 When a player chooses to move a Chickapig, the Chickapig continues to move in the chosen direction until they run into another Chickapig, a hay bale, the cow, the sides of the gameboard, or the side of one of the goals. When a Chickapig encounters one of these obstacles, the Chickapig stops in the space before the obstacle. This movement counts as one action no matter how many spaces the Chickapig moved. Players can only move their own Chickapigs and cannot move them into another player’s goal. The green Chickapig moved left until it was stopped by the blue hay bale. Players can use hay bales in order to create obstacles on the gameboard. Hay bales can be used to set up a path to get one of your Chickapigs into their goal or they can be used to block another player’s goal. Players can only move their own colored hay bales. Hay bales can move to any adjacent space except diagonally. Each space that a hay bale moves counts as one action. The green player has moved their hay bale down one space. When trying to block another player’s goal a hay bale (or Chickapig) may not be placed in a position that makes it impossible for a Chickapig to reach their goal. The red player would not be able to place both of their hay bales in front of this goal since it prevents the green player from getting their Chickapigs into their goal. To begin the game the cow stays in the pen in the middle of the gameboard. 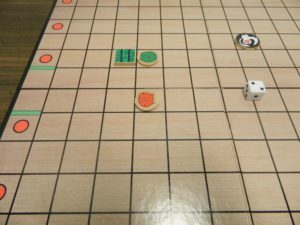 When a player rolls a one on the die they have the option to move the cow to any spot on the gameboard instead of taking one action. 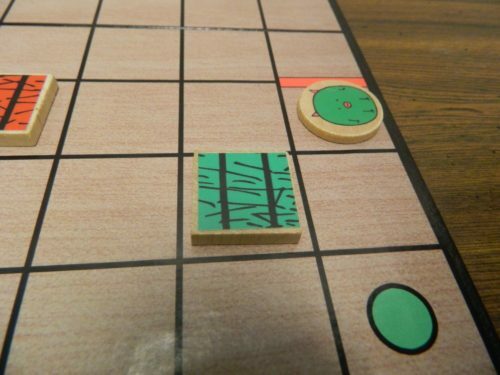 The first time this is done the pen in the middle of the gameboard is removed from the game. Whenever the cow is placed on a spot using this ability, it leaves a poop disc on the space that it is moved to. 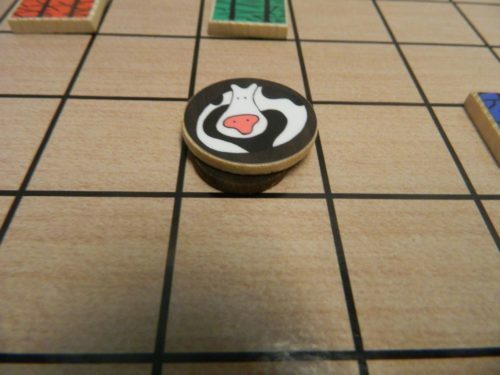 A player has rolled a one and has chosen to move the cow to a new space. A poop token is added to the space that the cow is placed on. 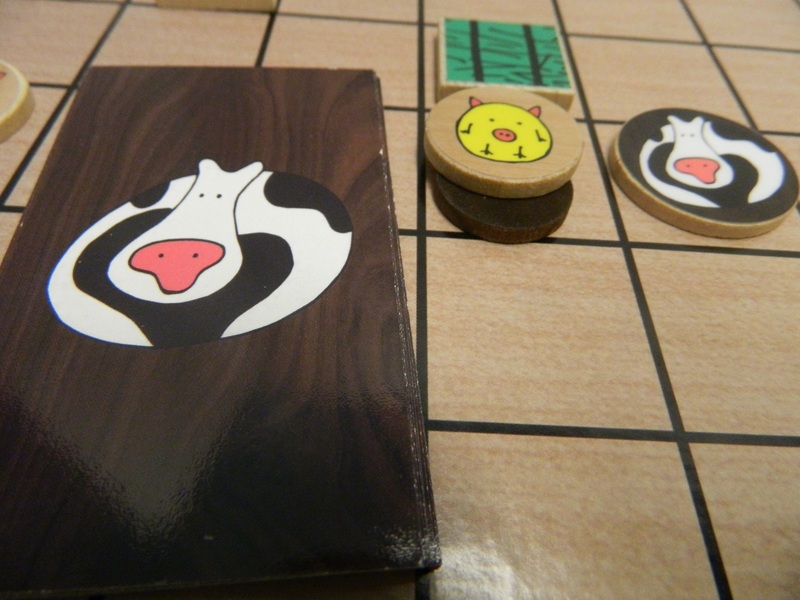 After the cow has left the pen in the middle of the gameboard, a player can use any roll to move the cow. The cow can move in any direction other than diagonally. Each space the cow moves counts as one action. A player has chosen to use one of their actions to move the cow one space to the right. When a player moves one of their hay bales onto a poop disc or a Chickapig moves through one (poop tokens are not an obstacle that stops the Chickapigs), the player who moved a piece on/through the poop marker has to draw a poop card. The card is read aloud at the end of the player’s turn. Since every poop card is negative, the punishment is enforced at the end of the player’s turn. The poop card is then shuffled back into the deck and the poop disc is removed from the board. The yellow player has landed on a poop token and has to draw a poop card. When a player rolls a two they can opt to draw a daisy card instead of taking their two actions. All daisy cards benefit the player in some way. Daisy cards are kept in a player’s hand until the player decides to play them. A daisy card can’t be played on the turn that it is drawn. Players can only have one daisy card in their hand at a time. After a daisy card is played it is shuffled back into the deck. 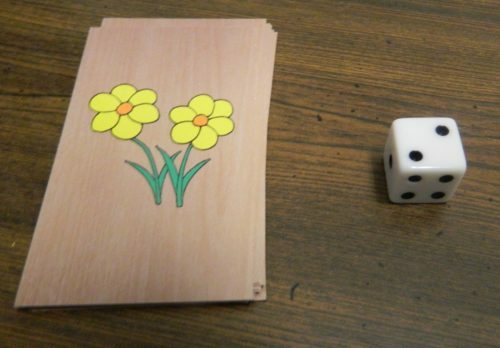 The player has rolled a two so they can either take two actions or they can draw a daisy card. Here is an example of the different actions a player can take on their turn. 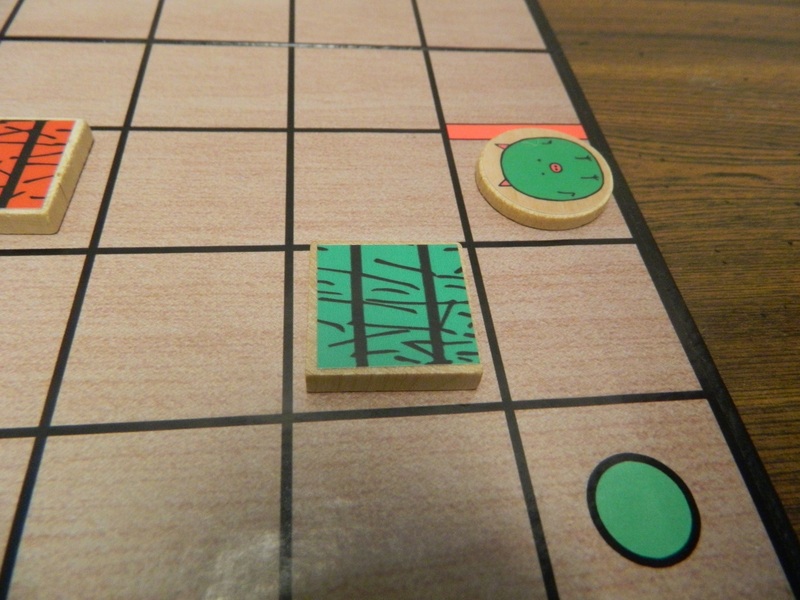 The player has rolled a six so they will take six actions. First the green player moves the cow one space to the left. Next the green player moves the green hay bale right one space. The green Chickapig moves up until it stops at the cow. The Chickapig moves left until is stops at the hay bale. The Chickapig moves down and is stopped by a red Chickapig. The green Chickapig moves into its’ own goal. The game ends when one player gets all of their Chickapigs into their goal. The first player to get all of the Chickapigs in their goal wins the game. 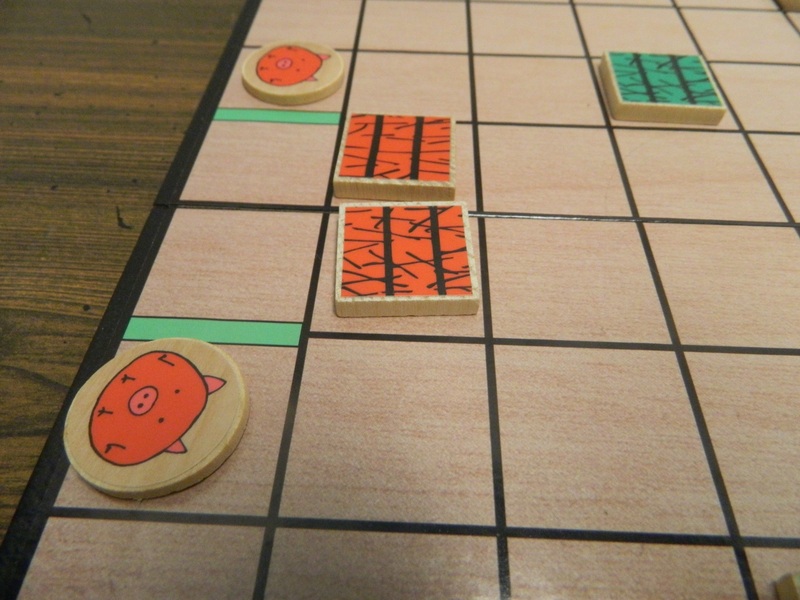 In Chickapig all of the players control a group of Chickapigs (a mix of a chicken and pig) who are trying to get back to their pen. 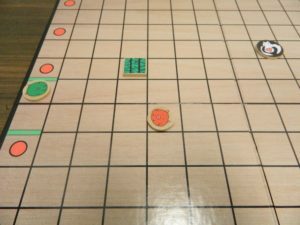 What is unique about Chickapig is that while a board game, it is also kind of an abstract puzzle game as you have to try and figure out how to move the different pieces around the board to create a path for your Chickapigs to reach their pen. While it won’t be for everyone, I had quite a bit of fun with Chickapig. Chickapig is not a complicated game. The game can be taught to new players in minutes. All of the pieces except for the Chickapigs move one space in any direction except diagonally. The Chickapigs slide in any direction (except diagonal) until they encounter another object. That is pretty much a summary of most of the game. The game has a recommended age of seven which seems about right. Younger children could probably understand how to play the game but probably wouldn’t understand the underlying strategy in the game. Due to its’ simplicity I think Chickapig is a game that would well with families and people that don’t play a lot of board games. 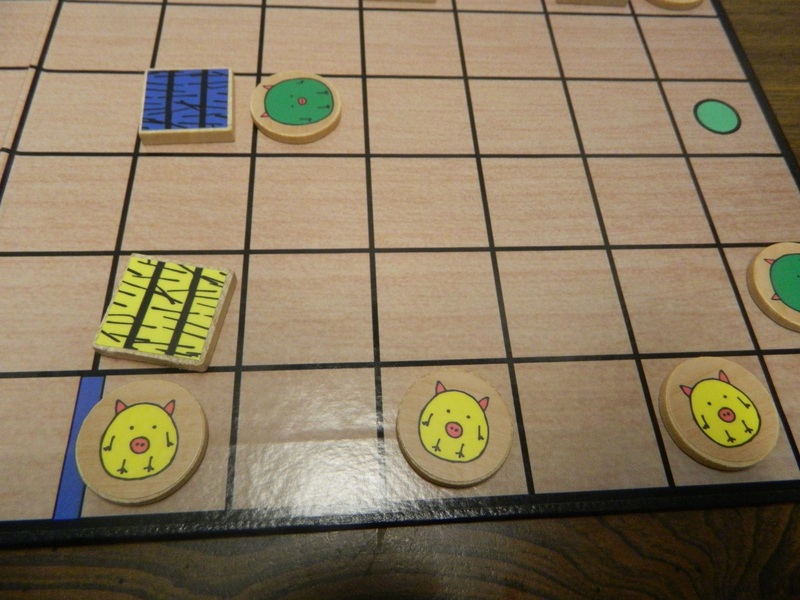 While Chickapig is not a complicated game, that does not mean that it doesn’t lack strategy. Although the mechanics are really simple, to do well in the game you need to think out your moves carefully. Players need to figure out how to manipulate the different pieces on the board in order to create a route for their Chickapigs to reach their goal. To be good at the game you need to be able to think out how different moves will position your Chickapigs in relation to their goal. I don’t really think anyone will have trouble playing Chickapig but I think players that are better at spatial puzzles/games will probably be best at the game. Creating paths to your goal is not the only factor in play while playing Chickapig. It is important to block the paths of the other players. Preventing the other players from easily getting their Chickapigs to their goal is just as important as getting your own Chickapigs to their goal. Ignore another player for too long and they could quickly win the game. This balance between helping yourself and hindering your opponents is an interesting decision you have to make in the game. The decision does bring up that you are not totally in control of your own fate in the game. The other players’ actions play as big of role in you winning as your own actions do. If any of the players don’t want you to win it is pretty easy to gang up on you preventing you from winning the game. Players that are ignored for the most part have a pretty significant advantage in the game. If one of the players ignores their duty to defend against another player, that other player will likely win the game. Players can also really benefit off using other players Chickapigs and hay bales as obstacles in a path for their Chickapigs. I would say that Chickapig has a moderate amount of luck. Any game that uses a die is going to have luck in it. The higher number you roll the better off you are going to be. If you roll a lot of sixes you are going to have an advantage over a player that mostly rolls threes or fours. I like that Chickapig gives a little break to players that roll ones and twos by giving them a special action that they can perform. I think rolling a high number is still better but the ability to move the cow to any space or draw a daisy card limits the disadvantage of rolling a low number. Speaking of the cards I am surprised that they didn’t have as big of impact in the game as I was expecting. Some of the daisy cards are pretty strong and some are considerably better than others. For most of the cards though you would probably be better off rolling a six. They are a good consolation prize for rolling a low number though. I was most surprised by the poop cards because they weren’t as big of a punishment as I was expecting. I went into the game not looking at the cards to be surprised by them during the game. At first players were a little hesitant to go on the poop tokens but after seeing some of the poop cards I didn’t find them to be too much of a deterrent. All of the cards hurt you but most are not game changing. The only really bad poop cards are the cards that make you return one Chickapig to the board that you got to your goal. I really don’t like game changing cards but I think most of the poop cards could be a little more powerful . I would say that Chickapig plays pretty quickly. I would guess that a typical game plays in about 15-20 minutes depending on how much the players go on offense and defense. If players play really defensively the game could take a little longer but I can’t see a game going over 30 minutes. 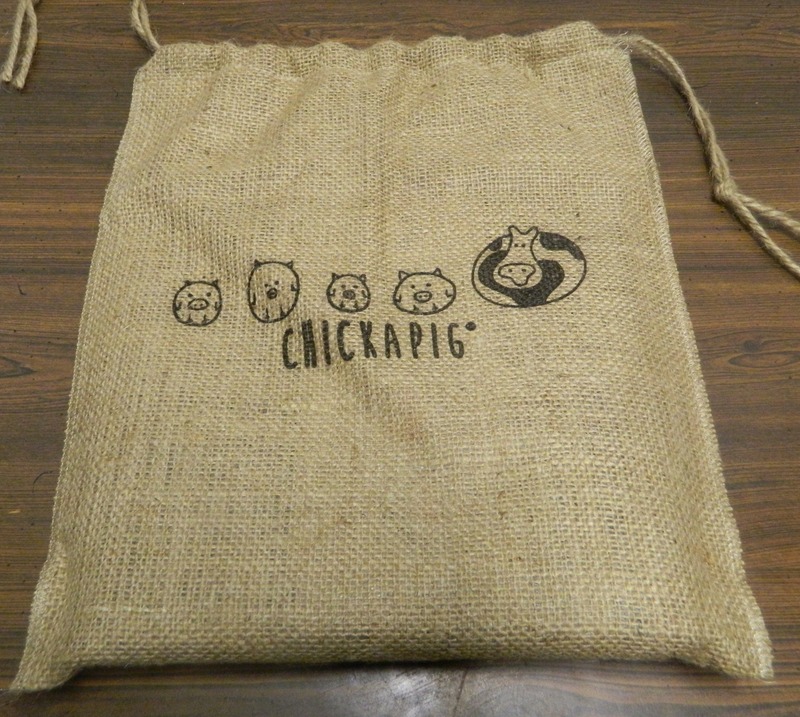 With the short length, Chickapig is the type of game that you are probably going to want to play a couple times in a game night. The short length is also good in case luck is just not going your way so you aren’t stuck in a game that you have no chance at winning. Unless someone has terrible luck the game seems to stay pretty close until the very end. 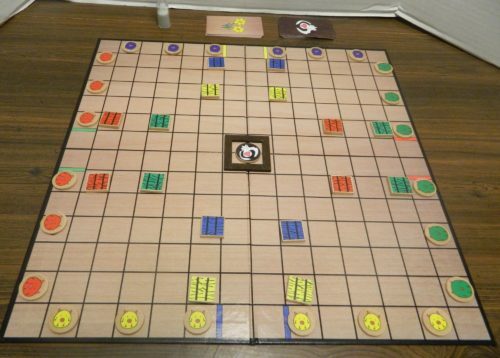 Chickapig is a four player/team game. The game works really well as a four player game since there are enough obstacles on the board without being overcrowded. Based on how the game is played I don’t think the game could be played with three players since the player that doesn’t have a player playing across from them will have a huge advantage in the game. While Chickapig is a four player game I think the game could work in a two player setting. I don’t know how the game would play with both players sitting across from one another using only one color. I think playing the game where each player controls two colors at the same time would be interesting. Players would have to work with both colors to help both of their colors get to their respective goals. As I mentioned earlier, Chickapig is probably not going to be for everyone. I enjoyed the game but that might not be the case for everyone. 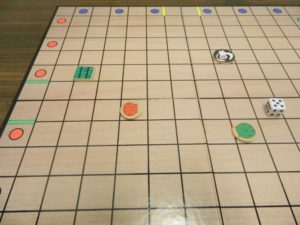 While it is not as puzzle driven as a game like Ricochet Robots, there is quite a bit of puzzle solving/spatial thinking in the game as you try to figure out how to move your pieces around the board. The puzzle solving isn’t that complicated but people who hate these type of games probably won’t like Chickapig. Being a pre-release version of the game I am unsure what the final copies of the game will look like. Based on this version of the game I received, I would say that the components already look pretty nice. The discs are made of wood and look nice. The version I was sent has stickers on the discs to indicate the different pieces but the final version is supposed to have the artwork printed right on the wood. The artwork look pretty nice and the Chickapigs are pretty cute. The gameboard is a little bland but serves its’ purpose by making all of the spaces stand out. Chickapig is a fun game. 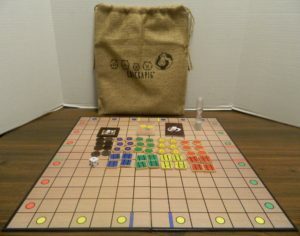 The game is easy to play but has quite a bit more strategy to it than you would expect. You need to plan out your moves in order to create ways to get your pigs to their goal. At the same time you need to put up roadblocks to prevent the other players from reaching their destination. 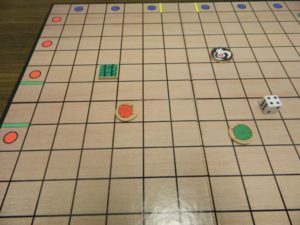 Chickapig relies a little on luck but is still a fun little strategy game for families and people that want a light to moderate abstract strategy game. If the game’s premise sounds interesting to you I would look into Chickapig. Chickapig’s Kickstarter campaign runs until August 26th, 2016. With a pledge of $50 or more you will receive a copy of the game. For more information check out Chickapig’s Kickstarter page. 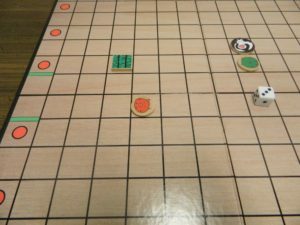 A simple game that still has enough strategy. Relies a little too much on luck. The cards don't impact the game as much as I would have thought.